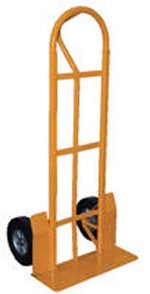 Heavy Duty Steel "P" Handle Hand Truck-Dollies. The "P" style hand trucks are ideal for transporting heavy and awkward loads. These trucks work well for the user that needs to free up one hand. The "P" shaped handle makes the truck easy to steer and maneuver. Specs: overall size 22"W x 19"D x 52"H ; nose plate 22"W x 7"D; capacity 500lbs. ; galvanized finish. Available with hard rubber and pneumatic wheels.